I remember vividly the first time I visited the Chicago Botanic Garden. I was silent (unusual for me) and in awe. Everywhere I looked, I saw plant labels, and looking at them provided me some kind of familiarity—like when you meet someone new, you want to know their name, what they do, what they like, right? Well, the same with plants. One important aspect of visiting a botanic garden is acknowledging its plant collection. Botanic gardens are living museums, and when you go to a museum, you want to know what is in front of you. 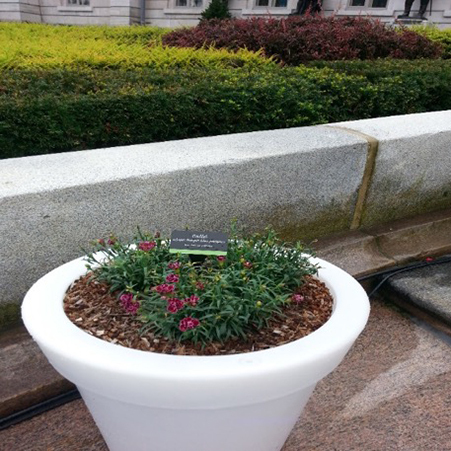 A display plant’s name on the label is the first interaction between you, the individual, and the environment. It’s important to recognize how vital it is to label our plant collection. Here at the Garden, we use the International Code of Nomenclature for Cultivated Plants (ICNCP). Only scientific names—written in Latin—are universal worldwide. The scientific name of a plant usually consists of its generic name and its specific epithet, which forms the name of the species. There are no regulations for common names, but scientific names are constantly reviewed and occasionally, we have to replace labels where a plant’s Latin name changes when it is reclassified. 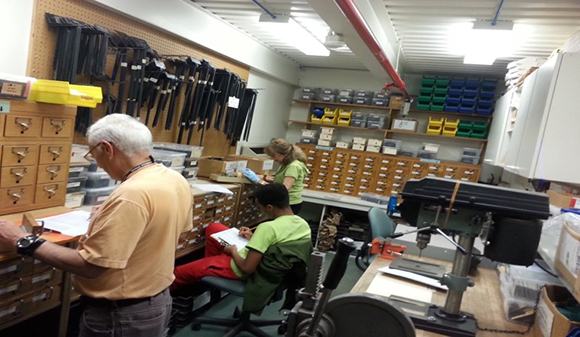 Volunteers Doris and Leon and intern Tremaine processing label requests. My volunteers and I are responsible for providing display plant labels to the horticulture staff and exhibitions department. People ask me, “Are you bored in wintertime, since there is nothing for you to do?” Uh, what? That may be the busiest season for the labeling team. We start checking label requests lists, which had been coming in since the previous December, pull labels out of the drawers, assess the accuracy of labels with no name changes, check their appearance, and assemble and process label orders. These processes take four months. In the next few weeks, as the Garden prepares to bloom, we are prepared to deliver 3,400 display labels for spring and summer annuals—plus, the labels for our permanent collection. 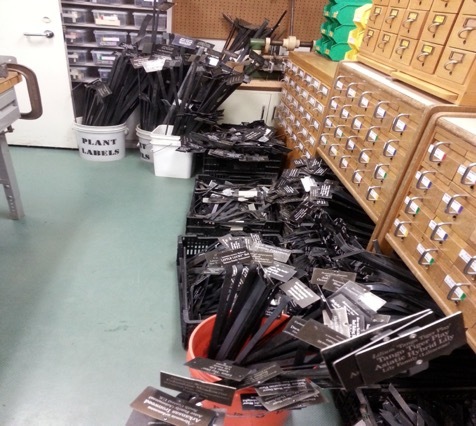 Our label room stores more than 45,000 plant labels. We have card catalog cabinets (remember those from libraries before we went digital?) and now even shoeboxes that hold our labels. The labeling team collects, maintains, disassembles, recycles, and discards labels. The Garden has produced close to 10,000 labels a year. How do we print our labels? This is our standard label, 2” x 4”, printed with a metalphoto process (photosensitive anodized aluminum); using silver letters with black finish. Our labels are printed on photosensitive anodized aluminum, a process called metalphoto finish. It withstands the temperature variations in our climate, and also doesn’t rust or fade. This keeps all the labels in our collection looking standardized, so they are not a distraction in the garden beds, but a helpful hint. A label from downtown, Quebec, Canada. I do not speak French, and before I get nervous, I see the scientific name with relief. A label from the Alpine Garden, Montreal Botanic Garden, displays only a QR code; you need access to the internet to scan the code and download the plant information. A label in Evian, France. 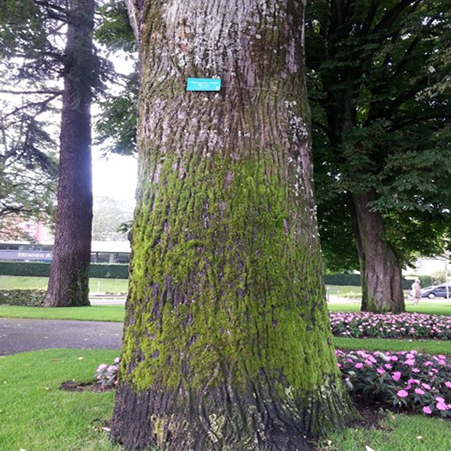 This style of label is attached to the bark of the tree on a spring; this allows the tree to keep growing without being harmed. 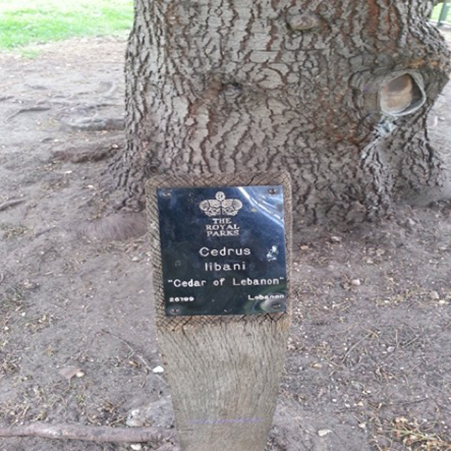 This label is mounted on a post at the Royal Botanic Gardens, Kew, in London, England. They speak English here, but the common name of the plant could have varied. Still, as long as I see the scientific name, I know what I see. Labeling at the Imperial Palace, Tokyo, Japan. I’m not fluent in Japanese, but I can read the Latin names. This is a big display/interpretive label, about 12 inches by 18 inches. 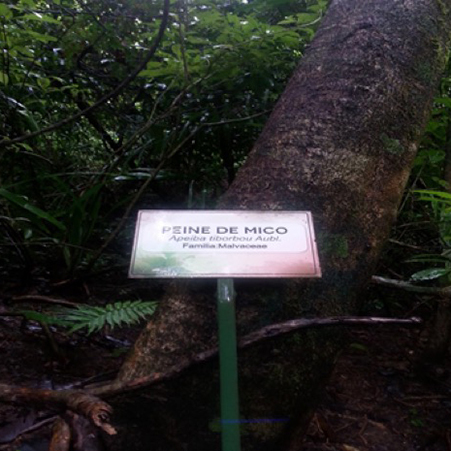 A label in Manuel Antonio National Park, Costa Rica. I speak Spanish, but the common name would vary from region to region, so I stick to the scientific name. This label is big and sturdy, around 7 to 8 inches across, and is made to withstand the constant humidity. Next time you visit the Garden, check out the Linnaeus statue in the Heritage Garden and see the decoding of a plant name. I often thought of winter as DOWNTIME for the Botanic Gardens. This was a very informative article. Thanks! There is a lot of planning involved this time of the year. Muchas Muchas FELICIDADES hermana, muy orgullosa de tu capacidad y trabajo. Tan sencillo que se ve, y tanto trabajo detrás de sólo una etiqueta. Felicidades por tu labor. Dear sister, I’m very proud! 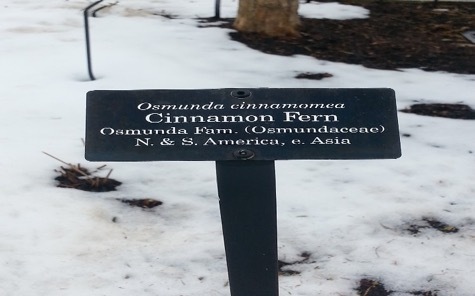 I always wonder why at the parks, and places similar to botanic gardens all labels were printed with scientific names; now I know is their Latin names. It is good to know that at least in some areas, the whole world is using a common thing, so we can speak, as you said: plant language! Also happy to know that we have places like your Botanic Garden that keeps alive all our nature. Keep the good work and thanks for sharing this information! Great informative posting concerning the identification of plants AND the process….thank you! To develop this work, a high level of organization is required. You are like a hardworking ant and vigilant of the needs of that place that should be an experience to know. Congratulations and thanks for sharing! Mi estimada gaby muchas felicidades el sacrificio y la dedicacion llevan al triunfo y ahi esta un trabajo del cual puedes sentir y estar orgullosa. You have to visit the Gardens of Madrid, Barcelona and Valencia, your experience can give us ideas. Thanks for telling us your professional history! I had the opportunity to visit some beautiful historic gardens in Spain and the Botanic Garden of the University of Valencia. I always pay attention to what other gardens do regarding plant labels. In this particular case, where people speak Spanish and Valencian…and the plant label written in Latin. So much information packed into this posting. I love it! It is always interesting and fun to be part of the important work that we do in this department. Que hermoso trabajo el tuyo, muy buen artículo y ahi se refleja la experiencia, el trabajo y la dedicación de varios años. En el idioma que se, la finalidad es una y es el saber que aquí y en china es ls misma especie. Sigue adelante y espero pronto leer el siguiente artículo!!!. It is truly unbelievable how much work the labels needed. Great article, very informative. The next time I go to the botanic garden in Germany I will definitely pay the more attention. It is in my bucket list to one day visit your country and experience the rich heritage of gardening there. Such an informative piece, thank you for that. In a time that neither we grown-ups nor our kids have a real relation with plants – let alone knowing their “names” ! – we need more such info to read, digest and share with youngsters in particular. I’ll keep looking for similar stuff. Good luck and keep having fun with labeling these beauties. I would love to see some of the gardens in your country and experience and feel the influence of different gardening styles. Thank you for reading us from a far away place. Great article! Labels are so important! I’m from Qinling National Botanical Garden, which is a bright new garden in China. I were lucky to have the chance to work with Gabriela and her group. They share their knowledge unselfishly with me. I really learned a lot from them. If you know them ,you’ll love them. By the way,the tiny label room is one of the most organized area in the CBG in my mind. Nunca me imaginé el trabajo que existe detrás de un jardín, para mi, se limitaba a los jardineros que mantienen hermosas las plantas. Este aspecto tan importante de etiquetado, la cantidad de etiquetas y de información que se debe cotejar e investigar es nuevo para mi. Felicidades a todo el equipo por esa labor atrás de reflectores que es muy importante para todos los que vamos de visita y nos tomamos el tiempo para leer la información y creemos en ella al 100%. Saludos. 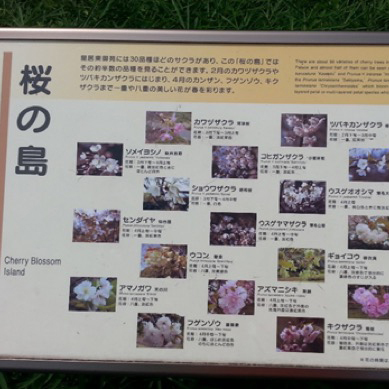 I would like to know if the label from Alpine Garden, Montreal Botanic Garden that displays only QR code (information is activated using a trigger like a Quick Response code), can be considered a kind of “Vision-based Augmented Reality”. The QR code system has different applications. These ones give you more information about the plant name. I would not say it is an “augmented reality” per se. A lot of museums are using them to shorten the signage and help the visitors with more information. 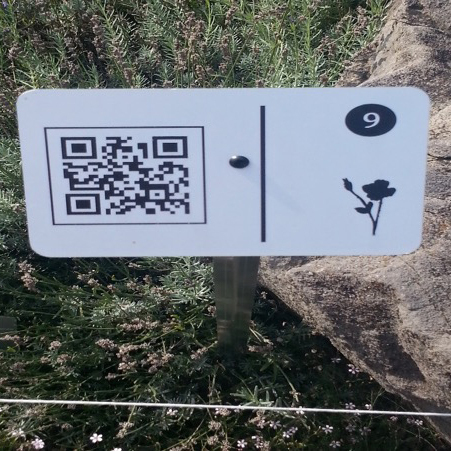 The last information that and obtained is that the QR codes installed in the garden, integrate “The Alpine Garden Misguide” at the Montreal Botanical Garden (MBG). As there are two primary formats for “Augmented Reality (AR)” – location-based and vision-based, I think that in the Alpin Garden Misguide must mix the two kinds of AR.